In keeping with the Government’s mandate for facilitating ‘Ease of doing business’, EPFO has taken a step further. In the august presence of Shri Bandaru Dattatreya, the Minister of State (Independent Charge) for Labour & Employment, EPFO has entered into agreement for collection of EPF dues from employers and payment to beneficiaries as well through multiple-banks in place of erstwhile single banking system here today. Collections of EPF dues have been started with PNB, Allahabad Bank, Indian Bank, Union Bank of India in addition to State Bank of India through direct online mode. Now, EPFO has signed agreement with another five banks viz. Bank of Baroda, ICICI Bank, HDFC Bank, Axis Bank, Kotak Mahindra Bank for collection of remittances and payments to beneficiaries, at zero transaction charges. It will facilitate all the stakeholders of EPFO by allowing the employers to deposit their EPF dues in a hassle-free, anywhere, anytime manner and PF members by direct payments of their bank accounts. 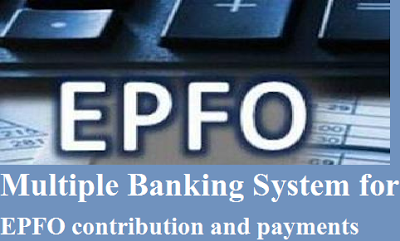 Consequent upon signing of agreement, the employers having bank account with these banks may deposit EPF dues directly in EPFO’s account using internet banking on real time basis instead of going through the aggregator mode. Multiple Banking System for EPFO contribution and payments, Collections of EPF dues have been started with PNB, Allahabad Bank, Indian Bank, Union Bank of India in addition to State Bank of India through direct online mode. Now, EPFO has signed agreement with another five banks viz. Bank of Baroda, ICICI Bank, HDFC Bank, Axis Bank, Kotak Mahindra Bank for collection of remittances and payments to beneficiaries, at zero transaction charges.